Керкинитида Евпатория история с древних времен, до наших дней Отдых и лечение в Евпатории » О Крыме - More about the Crimea. 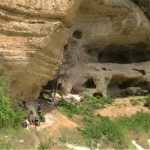 » The Crimean Cave Towns. 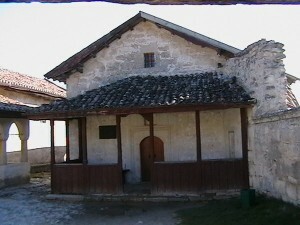 Not only the Khan’s Palace Museum attracts visitors to Bakhchisarai. 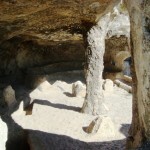 No less popular are such historical monuments as Cave Towns. 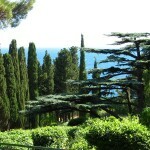 They were first mentioned in the written documents as far back as the 13-century. Their names are Kachi-Kalyon, Eski Kermen, Mangup Bakla, and Chufut- Kale. 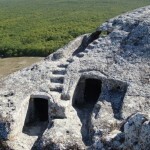 The proper explanations to these astonishing monuments were made in the last century. The age of them is controversial. Some of them appeared in the 8 century — Kachi-Kalyon, Mangup in the 6th century, Eski-Kermen in the 5th century, and Bakla in the 4th century. 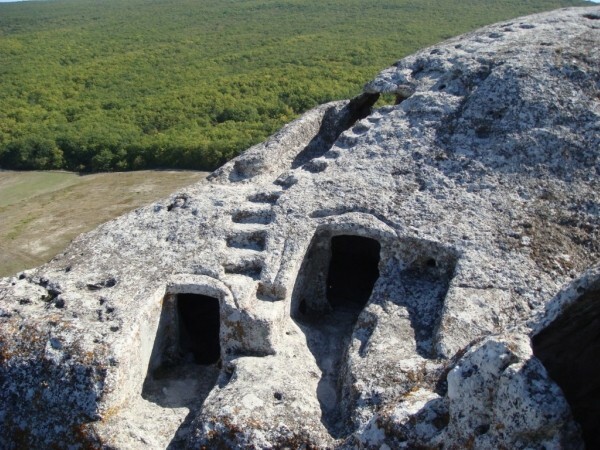 The cave towns were first of all feudal castles and also medieval towns and monasteries situated in the natural fortresses — the table-like mounts with abrupt precipices.Kachi-Kalyon is situated in the valley of Kacha opposite the village of Bashtanovka. It appeared on the crossroads of trading ways and was known for its wine-presses. There were about 120 of them. More than 250 tons of grapes could be processed in them simultaneously. Pottery-making was highly developed too. In the VIII -IX cc. a monastery sprang up there. The remains of it can be seen now. In 1778 the monastery ceased its functioning. 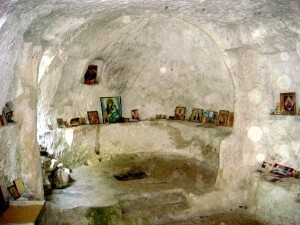 In 1850’s St. Anastasia monastery appeared and existed up to 1921. 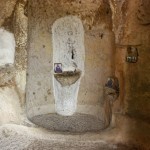 The place is known for its spring with fresh sweet water. Opposite Kachi-Kalyon on the hill covered with forests a big graveyard is spread out. Probably, potters and smiths, cattle-breeders and carriers were buried there. 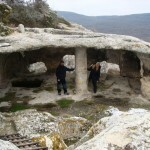 Tepe-Kermen (“Peak Fortress”) is a cave town with man-made caves. There are about 300 of them on the area of one hectare. 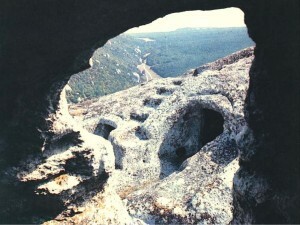 There are caves consisting of two or three «rooms». 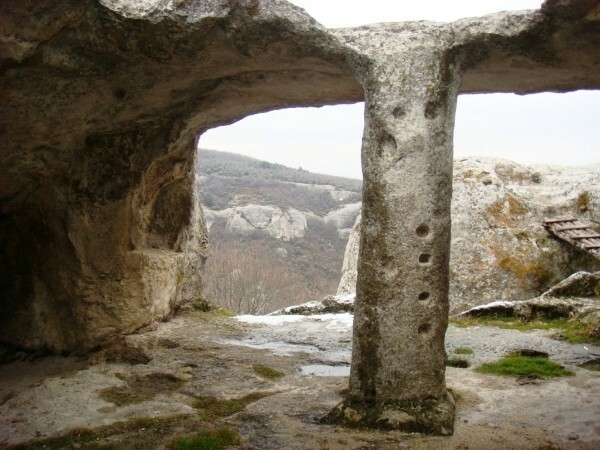 There you can see a church hewn in the rock. 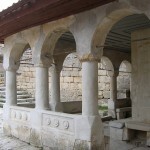 It was built in the period of iconolatry in the VIII-IX cc. 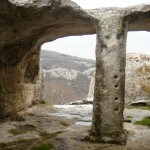 There were some more caves and on-ground churches on the plateau. The scholars say it was a monastery. But some of them think it was a feudal castle. There isn’t a single well found here. It’s a question how the dwellers managed to get water. Probably they collected it into special containers hewn in the rocks. 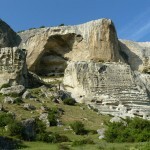 Kyz-Kermen Mount and a cave town on it can be seen from the western precipices of Tepe-Kermen. 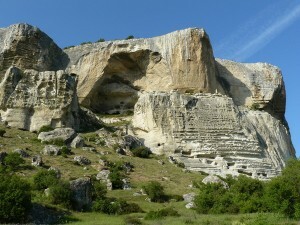 According to scholar Weimarn such big cave towns as Chufut-Kale and Kyz-Kermen couldn’t exist simultaneously. As well as Tepe -Kermen, Kyz -Kermen is little studied. 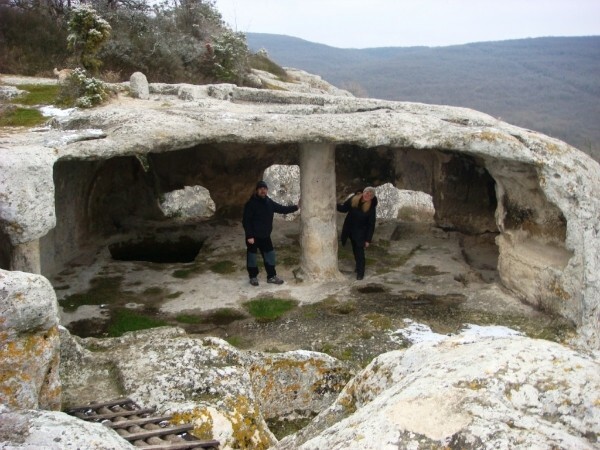 It is known that Kyz-Kermen’s people made vine of grapes. Their settlement had a defensive wall and a market place where the craftsmen used to sell their production. 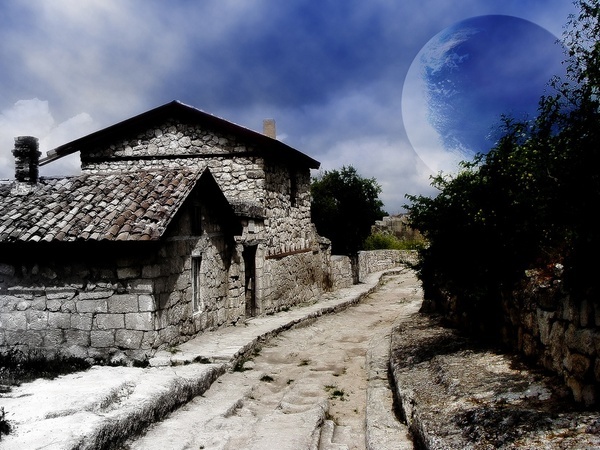 The dwellings were made of stone and clay with tiled roofs. On the defensive wall two semicircular towers still can be seen. 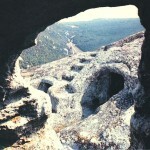 The blocks for them were hewn from the front side of the mount, where caves are visible from afar. 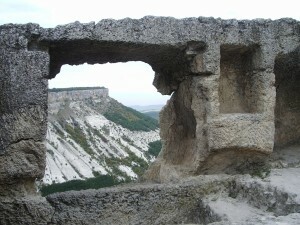 Eski Kermen (“Old Fortress”) is situated in the valley of Karalez spreading out on the table-like mount with abrupt precipices of about 30 meters high. 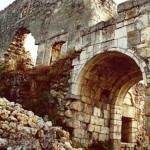 The Eski-Kermen castle was set up at the end of the VI century. In two centuries it was destroyed by invaders. 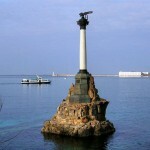 Then it had been restored and finally ruined again in the XIII century after Nogai’s raids. 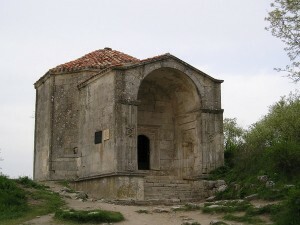 Among the remains of Eski — Kermen the most attractive is the Church of the Three Horse Riders. 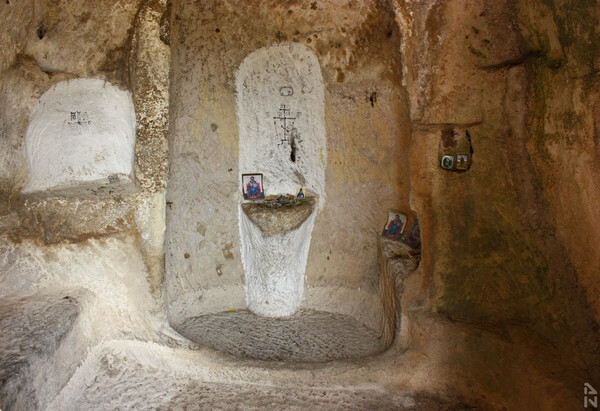 It contains mural paintings of the three saint riders with the inscription in Greek. Of great interest are the graveyards where golden decorations were unearthed. Mangup was a capital of one of the powerful kingdoms of Middle Age Taurika; it was the kingdom of Theodora, which came into being probably in the VI century. It was situated on the mount near the present village of Zalesnoye. 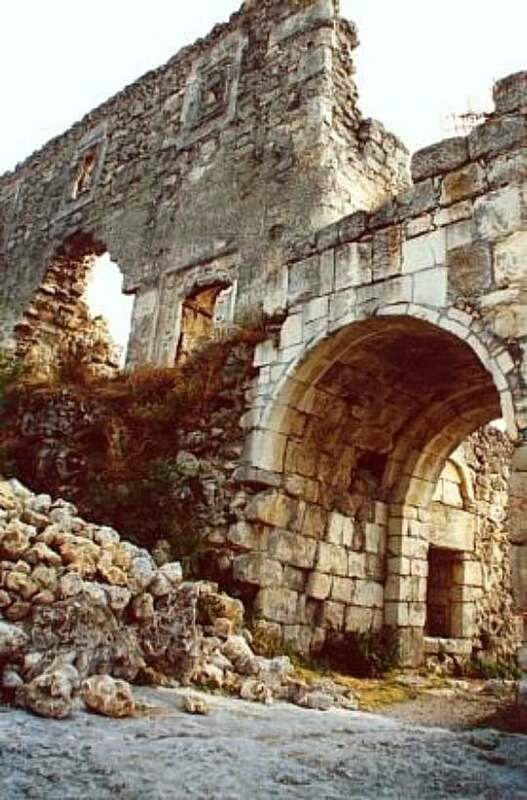 There were cave casemates and strong fortifications, the Prince’s castle and farmsteads, a temple-basilica of the saints of Constantine and Helena. 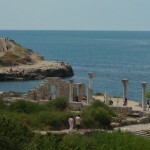 It is a grandiose monument of the former mighty kingdom of Theodora. 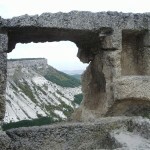 In July 1475 Mangup was besieged by the Turks who used an innovation of that time — fire arms. The defenders of the fortress withstood till December, the fortress was ruined by the enemy and became desolate. On the left bank of the Belbek river, not far from the village of Sadovoye one can see a tower rand a defensive wall. 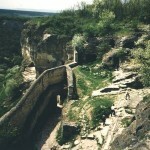 They are the remains of the Syuren fortifications that appeared in the Middle Ages and served as a feudal castle. 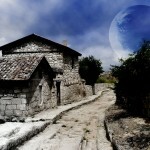 There was a Chilter-Koba monastery. It was not very big, only 25 residents lived here. Among the remains wine-processing grounds can be found. 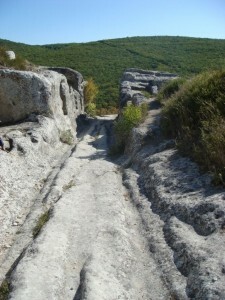 The excavations uncovered the remnants of the stone houses, a defensive wall. 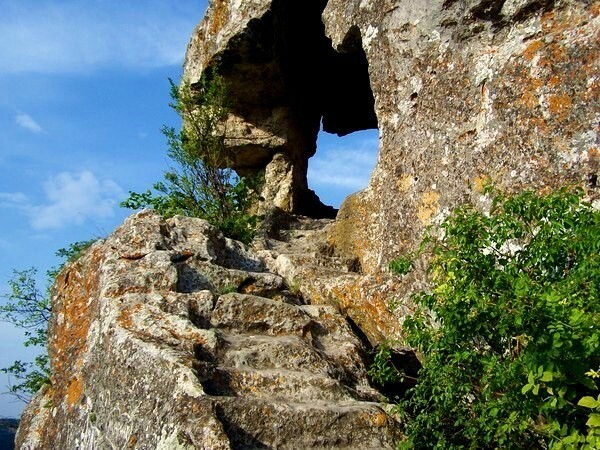 The castle resisted from the 7th century and is considered to have been ruined in 1475.
in the 1st centuries the tribe of the Alans, descendants of Scythians, settled on the Crimean peninsula. In the 6th century they were already Christians. 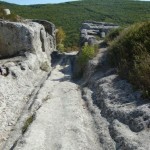 At this time the fortifications on the plateau came into being. 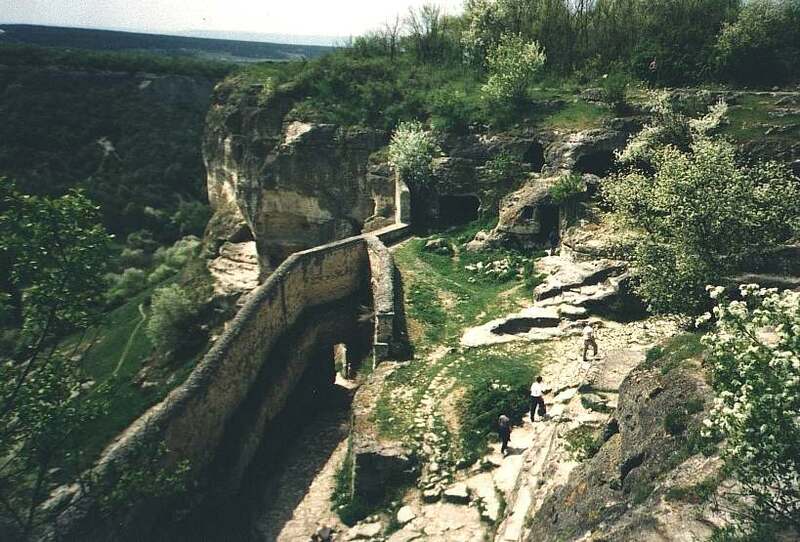 In 1299 the Alans were conquered by the Golden Horde and the fortress got the name Kyrk-Or (“Forty Fortifications”). 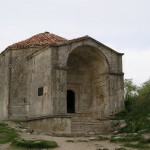 In the XV century the Crimean Yurt (Crimean Region) was declared independent of the Golden Horde and in 1449 the Crimean khan moved his capital to Kyrk-Or. In Kyrk-Or there were three community which peacefully coexisted: Moslem, Judaic and Christian. Each of the community lived in its block. In XVI century Mengli — Ghirey founded a new capital, Bakhchisarai, and the Moslem community came down from Kyrk-Or to develop new land. 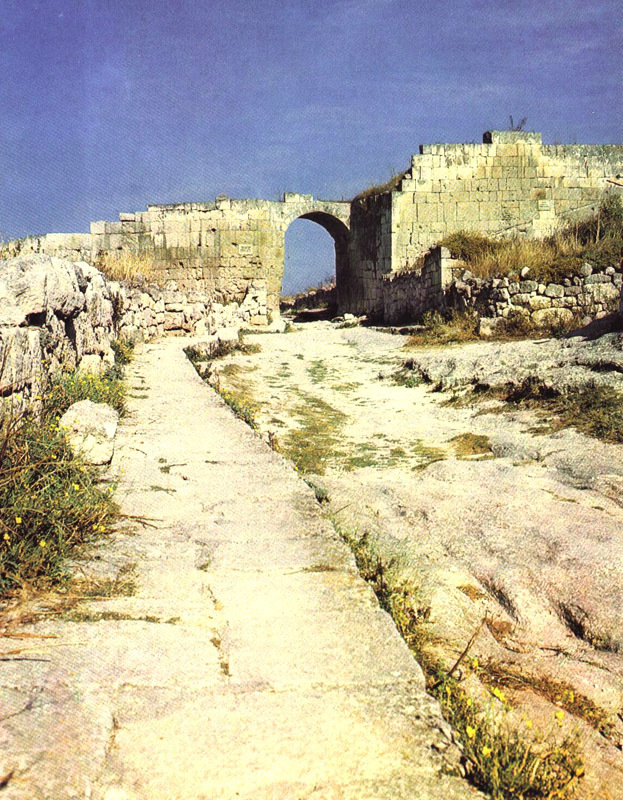 Only the Judaic and Christian communities stayed in the settlement on the plateau, which became to be called Chufut-Kaleh (“Jewish Fortress”). During the transmigration of Christians the Greeks and Armenians left Chufut-Kaleh and now only the Judaic community (Karaites) lived in the cave town. 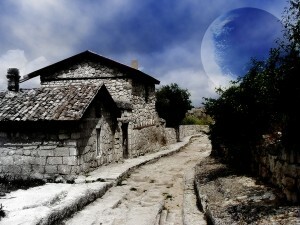 The Karaites, Turkic by origin, were the followers of the Old Testament Bible. The name «Karaite » means » one who reads». 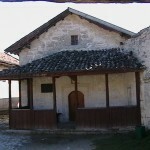 The Karaite community had a rather high level of education. 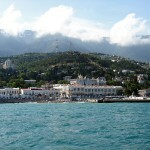 It was here that the first in the Crimea printing-house was founded in 1731. 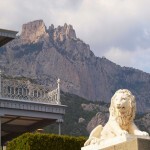 After annexation of the Crimea the Karaites settled in new places and in 1852 the town became desolate — only two brothers from the family of the Pighits lived there. The last resident of the cave town, scholar A.S. Firkovich was buried in the Karaite cemetery in 1874. 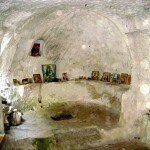 Chufut- Kaleh became a «dead town». All Russian tsars (exept Paul I) beginning from Catherine II visited Chufut-Kaleh. 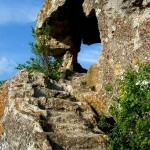 The last Russian tsar Nicholas II visited the cave town on September 19, 1902. 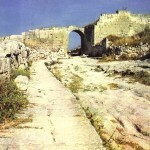 The walls and towers of the fortress, houses and temples were built by the Karaites. Some of the constructions survived; the earliest structure dates from the 14th century. 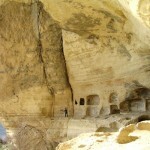 It is believed that the caves for defensive and household purposes were hewn by them, too. 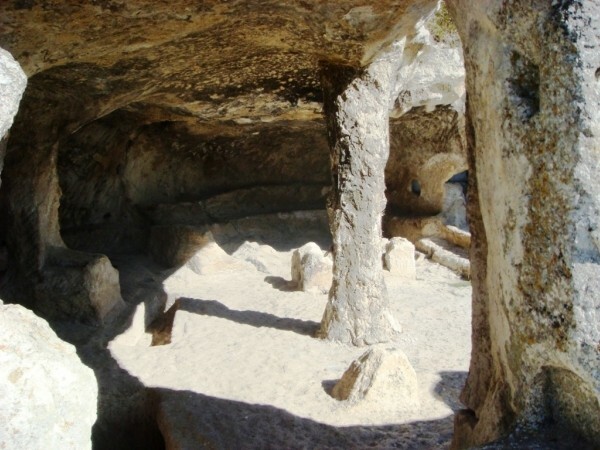 In the 16th century Chufut-Kaleh numbered about 400 houses and 5,000 inhabitants. There were two kenassas – the prayer houses for Karaim — built in the XVI and XVII century. The Big Kenassa was divided in three parts. The first part «Moshau-Zekenim» (“Seats for Seniors”) was for old men and another one for those who was prayed in mourning. 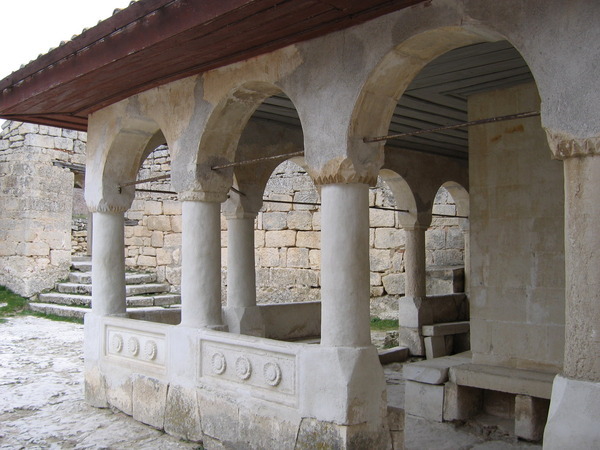 The second and biggest part «Shulkhan» (“Place for Parishioners”) was for men to pray in the morning and in the evening. In the third part there was «Gehal» (“Altar”) and rather scroll of Pentateuch (“Five Books”). 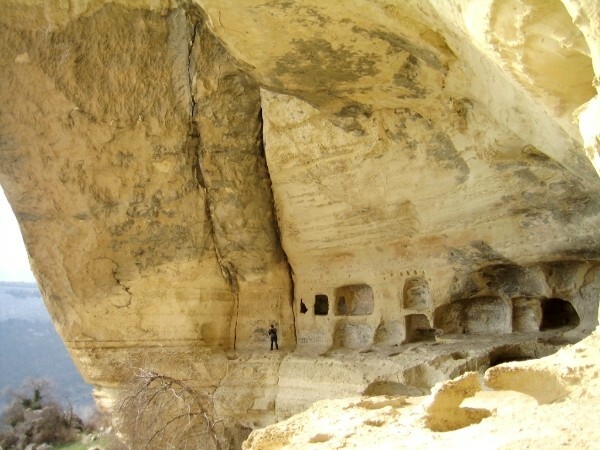 Many tourists visit Chufut-Kaleh, the «sky town,» «the fortress of treasures». « Все санатории — отдых и лечение.